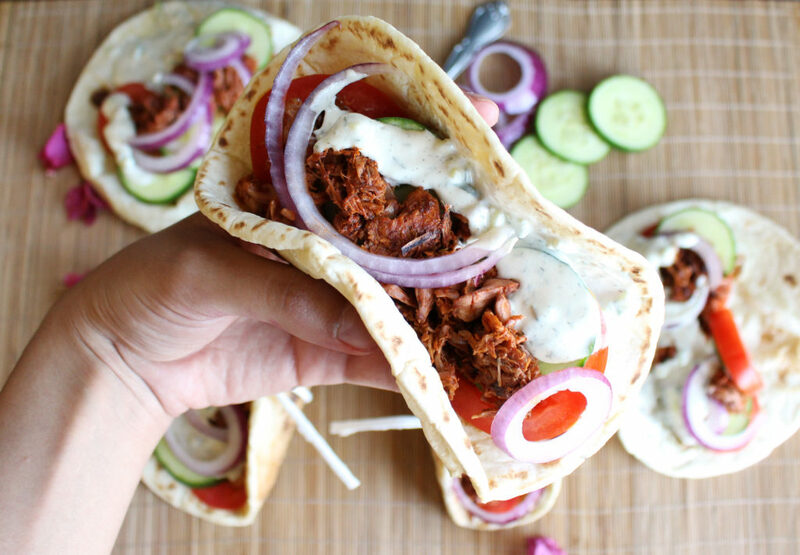 These delicious vegan gyros, made with gyro-spiced jackfruit and topped with a creamy and thick vegan tzatziki will satisfy your cravings for authentic street-style gyros! When I was young, my parents would take me and my sister to a small authentic Greek restaurant with the best gyros. They were seasoned with the perfect blend of Greek spices and topped with a thick savory tzatziki, making it impossible for your hands not to be covered in gyro juices by the time you finished the sandwich. 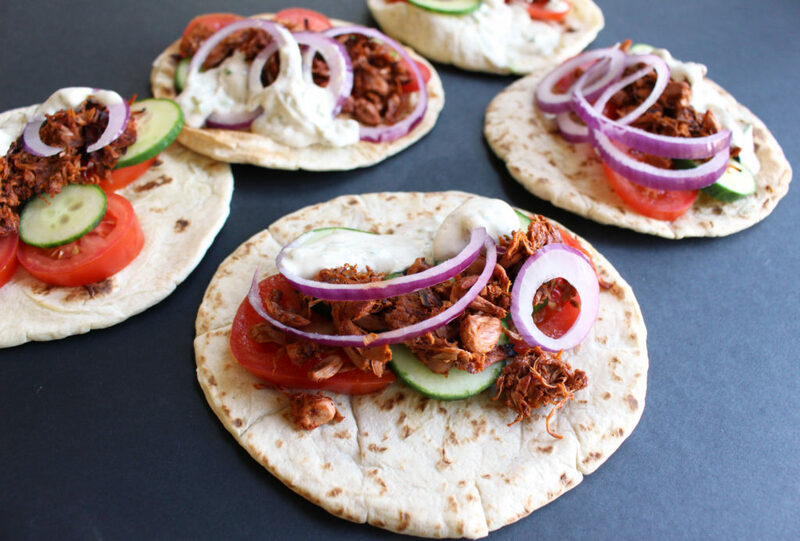 These are just as messy and delicious as your favorite authentic Greek gyro, but they are definitely a much healthier alternative. Roasting the jackfruit after sautéing it in a blend of gyro spices gives it the perfect meaty texture for these sandwiches. 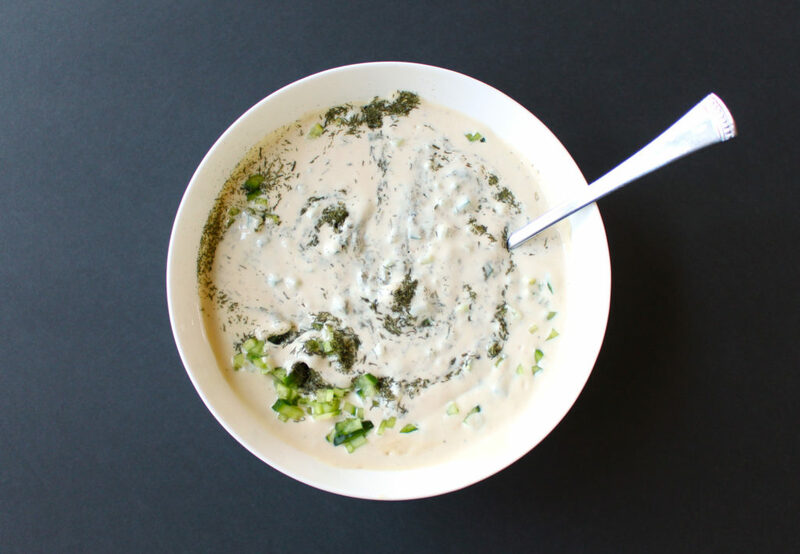 A blend of coconut milk and cashews makes the tzatziki lusciously creamy and thick. It gets even thicker as it cools in the refrigerator. My mom tried it and was surprised at how well it replicated the taste and texture of “real” tzatziki! Taking a bite out of one of these vegan gyros reminded me of my trip to Cyprus a few years ago, where you could walk by the beach and breathe in the salty ocean air mixed with the tantalizing smell of Mediterranean food grilling, wafting in from the restaurants. I was in Greek food heaven because there were gyros everywhere, including McDonalds! Although these gyros are definitely better than those ones. ???? I hope you love this recipe as much as I do! Don’t forget to comment below if you try this recipe or pin it for later! ???? And I would love to see your recreations on Instagram @zenanzaatar! 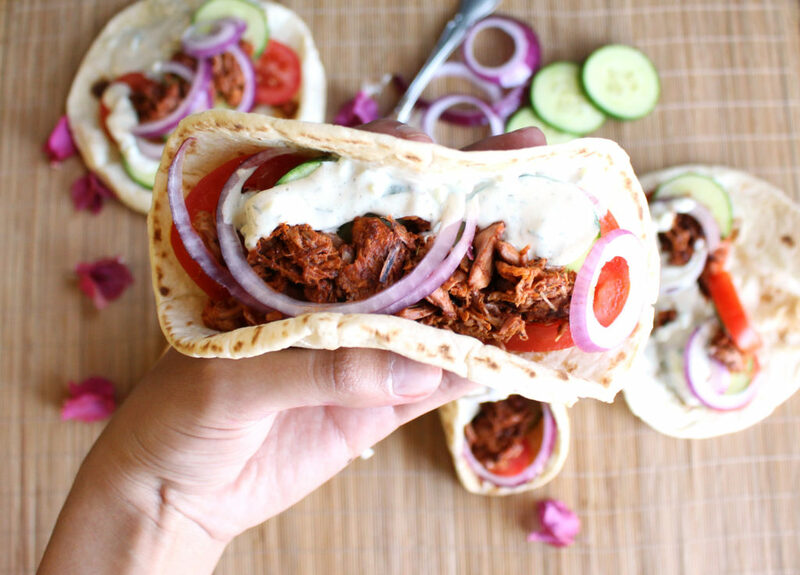 Delicious street-style vegan jackfruit gyros topped with a thick and creamy vegan tzatziki. Prepare vegan tzatziki by blending all ingredients for the tzatziki except for dill and cucumber in a high speed blender until smooth. Mix in finely diced cucumber and dill by hand after blending. Set aside. Leave in the refrigerator for a thicker sauce while you prepare the gyros. Mix all gyro seasoning spices together in a small bowl. Set aside. Mix lemon juice, balsamic vinegar, and ketchup together in a small bowl. Set aside. Drain and rinse jackruit. Chop and remove any hard parts or parts of the core. Preheat oven to 400F. Sauté minced garlic in olive oil or water until fragrant, about 2-3 minutes. Add jackfruit and sauté for a few minutes, then add gyro seasoning spices and stir to coat jackfruit in spices. Sauté for 7-10 minutes, until tender, and then shred into small pieces using 2 forks. Pour lemon juice, vinegar, and ketchup mixture over the gyro meat and stir to coat. Simmer for 5-8 more minutes. Add extra smoked paprika if you want a smokier flavor. 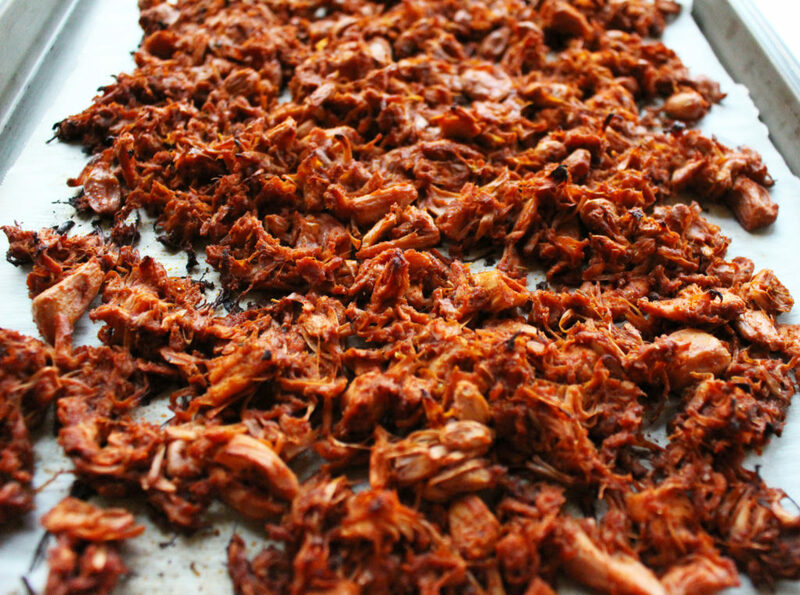 Line a baking sheet with parchment paper as you wait for jackfruit to cool. Bake jackfruit for 15 minutes for a meatier texture. Slice red onion, cucumber, and tomatoes. 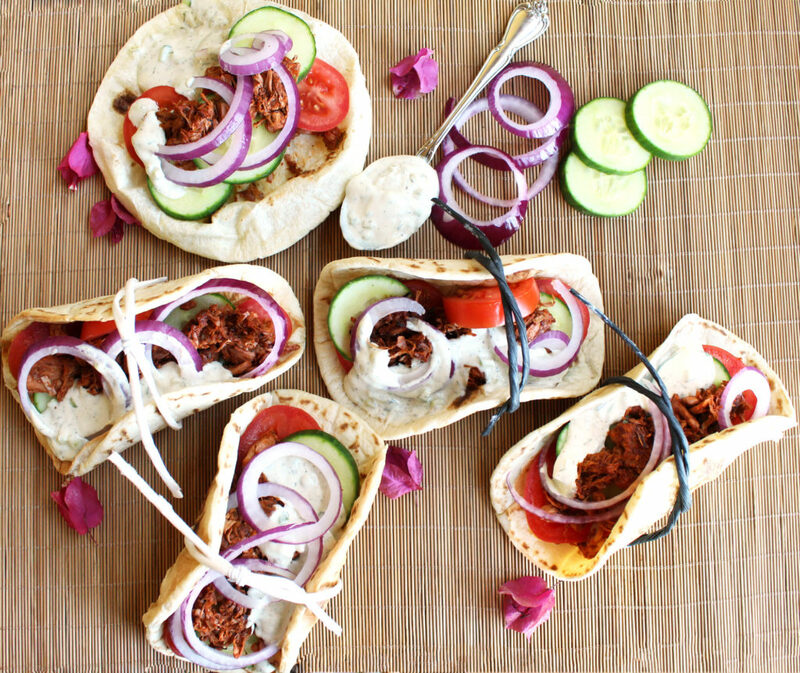 Assemble sandwiches by placing gyro meat, tomato slices, cucumber slices, and red onion slices on a wrap. Top generously with tzatziki. Enjoy! **I like to use Native Forest jackfruit because it cooks much faster and the core is already removed! (These smaller cans are equivalent to the typical 20 oz. cans of young green jackfruit.) You can also find jackfruit at most Asian markets. I love to make a different kind of recipes and last week I tried this one it was a great experience. It is a unique dish. 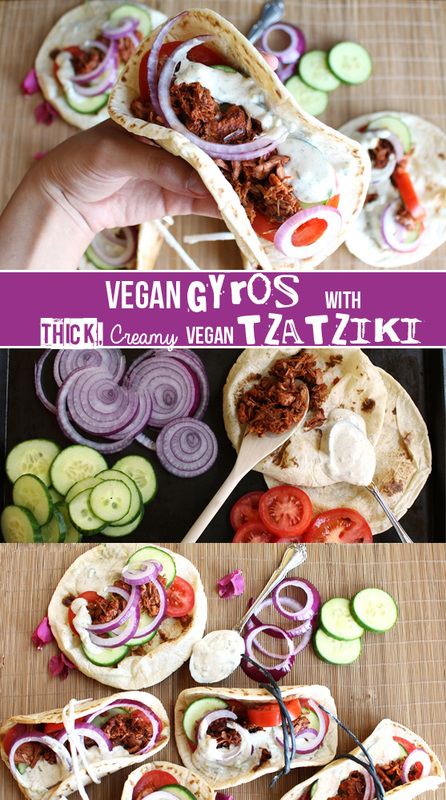 I can say that nobody is aware of vegan gyros with jackfruit and creamy tzatziki this article really helps the people who love to make and eat a different kind of dishes. I made this last night OMG!! Lady this was Amazing!!! Thx so much! !